One stop shopping, that’s the kind of thing I love. Take me to a place where I can cross off every item on my to-do list and you’ve got me smiling ear to ear. Well, for any builder, remodeler, realtor, subcontractor or anyone else involved in the Carolina building industry, the 21st Century Building Expo and Conference is your one stop shop. This exciting event takes place in Charlotte September 16-18. You can attend the Expo floor for free if you register before September 15. So there is no need to rush, but make sure you don’t forget to sign up! However, you might want to hurry up and submit your STARS Awards entry form. The STARS Awards Program recognizes the achievements and projects of the residential building industry. Categories include marketing, advertising, sales, landscape design, architecture/floor plan and a few others. Entries are due July 31st. The Gala announcing the winner will be held in conjunction with the 21st Century Building Expo and Conference. At the actual expo you can expect to see a wide variety of products and services from the industry’s leading manufacturers and suppliers. Of course with over 300 exhibits, would you really expect anything less? Some exhibitors include: Progress Energy, Carolina Glass and Mirror and NC State University wood products extension. If you are looking to get great educational information at the 21st Century Building Expo and Conference, then you might consider attending the three-day educational conference. Attend a class that interests you, such as one about green building or maybe one that focuses on thriving in this uncertain economy. This is an awesome event, one I can’t imagine passing up. You can easily spend two whole days wandering around the exhibits or even just an hour visiting one company you really like. How you enjoy the expo is up to you– but you definitely will enjoy it. 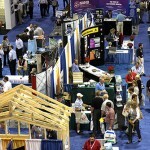 This entry was posted in Events, Featured, North Carolina and tagged 21st Century Building Expo and Conference, Charlotte, green building, STARS Award program on June 23, 2009 by Carol Morgan.